Rachel and Cam Pinkham are proud owners of a freshly renovated vintage caravan that now takes the form of a mobile cocktail bar complete with industrial bar coolers, stocking shelves and a window positioned perfectly for serving craft cocktails to guests. The 1960s Layton camper was given its makeover by Happy Camper Mobile RV Service out of Michigan and, with its recent completion, is now the newest offering from Fresh Coast Cocktails. 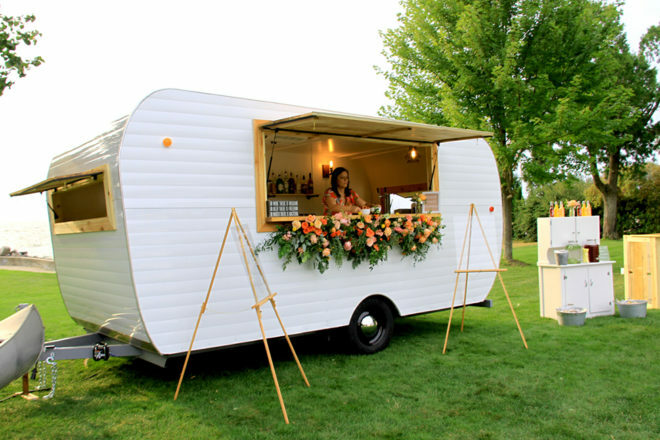 The mobile bar and cocktail service is now available for private events, weddings and other celebrations. 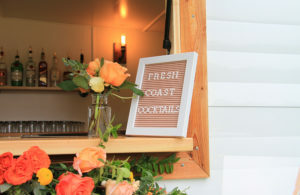 Along with the newly debuted caravan bar, Fresh Coast Cocktails also offers a large pallet bar plus a la carte services that range from customized craft cocktails and personalized signage to lawn games and additional decor. On the night of the debut, the lawn of Sister Bay Marina Park was filled with white linen high-top tables, a vintage loveseat and a canoe that doubled as a cooler for plates of sushi appetizers. The cocktail menu featured two special drinks for the occasion, plus wine and beer. The first feature drink was the New Fashioned: a delicious libation of Buffalo Trace Bourbon, blood orange juice, cherry bark vanilla bitters, Bing cherries, simple syrup, soda and garnished with a blood orange round. It was refreshing, moderately sweet and very drinkable on a cool August evening. The second feature drink was the Casa Paloma: a tart mixture of Casamigos Blanco Tequila, fresh grapefruit juice, lime, soda and a sea salted rim. The blend of bittersweet grapefruit and agave tequila is an acquired taste, but if you’re a tequila fan like myself, this drink is a familiar and welcomed sip. A list of craft cocktail options is provided to anyone renting the caravan, but Rachel is just as happy to create something unique for an event. 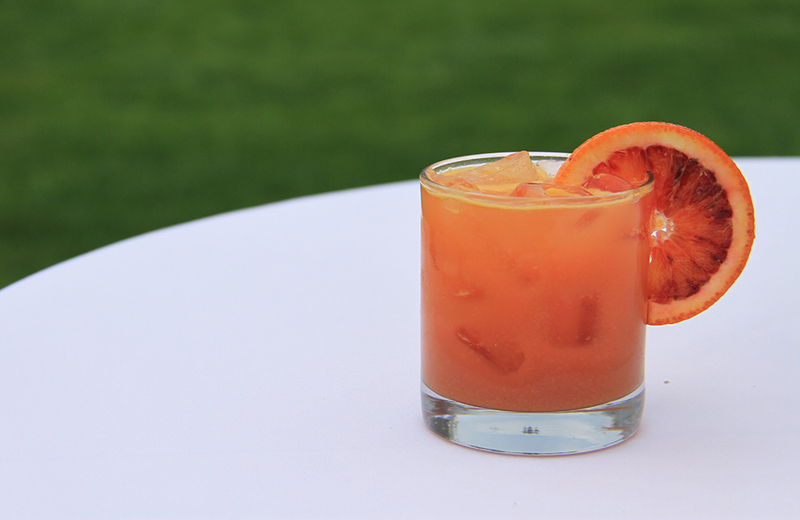 The current list focuses on using fresh, organic and not-from-concentrate ingredients. Heading into the offseason, Rachel is planning to test a variety of made-from-scratch syrups to incorporate into the cocktail creations.